Dr. Julie Beischel’s Research Asks -- Does a Reading From a Psychic Medium Help Relieve Grief? Interview with psychic medium researcher Dr. Julie Beischel explores the practical applications of a reading from a psychic medium. Alex Tsakiris: We’re taking these very deep, personally meaningful topics in a very stark, scientific, clinical way, and that ok because it helps us get some distance from it. But on this issue of grief, if we look at it the way you have, it really breaks down pretty nicely as a question we can ask scientifically. There are people who report this condition. We’ll call it grief. We treat this condition. We send them to a talking psychologist or psychiatrist and that person talks—talks—talks—talks. Then we measure afterwards. Sometimes they’re better; sometimes they’re not. Or, we send them in and to get some kind of pharmacological treatment. They get these little pills and they take them, pop–pop–pop. They either get better or they don’t. We measure that. You’re suggested that there are some other people, ones that have a had a reading with a medium and they report that this has relieved them of their grief. And in the same way we’re measuring these other treatments, we can measure them. That is how it breaks down, isn’t it? Dr. Julie Beischel: Yeah. And, that’s my training — drug trials. I used to design these kinds of experiments. There’s a protocol, and there’s a control group, and a treatment group, just like a drug trial. Instead of a drug it’s a mediumship reading. I designed this very specific protocol using a standardized grief instrument and two different funders have found it to be not what they were looking for. But it needs to get done. We’re now in the process of reaching out to the public to try and get support for that study. It really needs to be done. The same thing like when we just want to look at the validity of the mediumship information. We have to start at the beginning. Are they reporting specific and accurate information? Does it make people feel better? We did a pilot study and people reported anecdotally that it made them feel better. Today we welcome Dr. Julie Beischel to Skeptiko. As Founder and Head of Research at the Windbridge Institute, Julie is one of the world’s leading researchers studying psychic mediums. Julie holds a Ph.D. in Pharmacology and Toxicology from the University of Arizona. 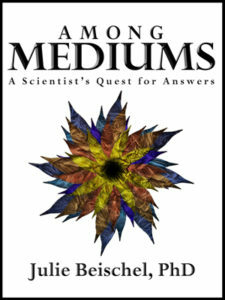 She’s here to talk about her new book, Among Mediums: A Scientist’s Quest for Answers. Dr. Beischel, welcome. I guess for those of us with a long memory I should say welcome back to Skeptiko. Dr. Julie Beischel: Thank you so much for having me again. Alex Tsakiris: It’s great. So Julie, you’ve written a wonderful little book here and it’s not just me saying that. You have some great endorsements for the book, as well. You know where I thought we might start is the story in the book about your very first reading. I think it’s not only an introduction into the way you came to research this topic as a scientist, but it also is relatable for a lot of folks because it’s the way that they come into contact with mediums for the first time. Dr. Julie Beischel: Yeah, the story is in a great amount of detail in the book but the bottom line is when I was in graduate school my mother committed suicide. A couple of years later, John Edwards was very big. The Crossing Over show was very big on TV. In my background, like you said, my degree is hard science and my family’s from the Midwest. I didn’t even know what a medium was until I saw this guy on TV. The people looked moved and the people on the show were reporting that what he was saying was accurate so I thought, ‘That’s really interesting, but I’m a scientist. I would have to see it myself.’ So I got a reading. I had known a little bit about cold reading and the kinds of things that a medium can guess just by looking at you or talking with you. So I knew to only say yes or no and those kinds of things. Alex Tsakiris: Let me interject a couple of things because you do a great job in telling a great story in the book about this reading and the lengths that you go to to prevent yourself from providing any of that kind of information to the medium. As you say, people generally talk about cold reading where the medium is saying, “I see an S or is that an N. Is it in your past or maybe in your future?” So you were well prepared for that, maybe even over-prepared as you say in your story. The other thing that struck me, and I can attest to this from my own experience with mediums, similar to you when I first went in I prepared myself. It’s really not that hard to do, right? I’d say the majority of mediums aren’t really fishing for that data as we are led to believe but are not wanting more information. Anyway, back to your story, you prepared yourself quite a bit for this reading, didn’t you? Dr. Julie Beischel: Well, I thought that I was preparing myself. I thought, ‘I’ll make up a code and I’ll ask my mom to say the answer to the code and then I’ll know that it’s real.’ I talk about in the book that I’ve come to realize that that doesn’t work. One of the alternative explanations for where a medium gets her information is right from the sitter, right from the living person wanting the reading so if I know the answer to the code and she gets it, she still could be getting it from me. It doesn’t demonstrate that she’s talking to my mom. She still could be getting that information right from me because I know the answer to the code. So I recommend that people just let it happen as it happens because the deceased are clever in my experience and they will find a way to demonstrate that it is indeed them. And like you said, I think it’s an important point that good mediums prefer to have no information from you. They would prefer to shush you if it wasn’t rude when you try and tell them things during the reading. When we do our certification of new mediums, step five test readings of our eight-step procedure, there are a number of readings within the testing so there are quintuple blind readings that get scored by email. Once those are scored we get the medium and the sitter on the phone. In the first part the sitter can hear the medium but the medium doesn’t have any information about the sitter, not even the gender or anything. So then the sitter scores that part where the medium’s just talking. In the second part I say, “Okay, now the medium can ask the sitter yes or no questions and the sitter can respond with yes, no, maybe, sort of, or I don’t know. More often than not, the medium doesn’t ask the sitter any questions. She just keeps going. The feedback, in my opinion, there are so many pieces of this we haven’t studied specifically but my understanding is that mediumship seems to be a right-brained process. When you start to bring logic into it the left-brain gets in the way. So if you start asking questions and making assessments the left-brain wants to take over and that kind of ruins it for the medium. So yes, a good medium, the less information they know that’s what they prefer. Alex Tsakiris: Right. And then obviously without telling the whole story, the conclusion of that reading left you with the feeling that there was something to this and that you might have in fact connected with your deceased mother, right? Dr. Julie Beischel: Yeah. She didn’t say, “Oh, I’m getting…” kinds of things. I was so skeptical, openly, the real skeptical, right? I didn’t know what it was and so I went there to gather some data. I made assumptions about how it worked so I thought that she must be on the phone with my mom so she should be able to get every single thing perfectly, right? So at one point one of the big things was she said, “Oh, there’s a Dalmatian dog with your mom.” And I was like, “Well, I guess. Our dog was half-Dalmatian so 50% accuracy point?” And she was like, “Come on!” At that point, she’d had enough of my skepticism but if my mom was going to talk about our dog, that’s unique. You know, “Show her a Dalmatian,” because if she showed her our weird dog that was half black Lab and half Dalmatian, she wouldn’t have recognized what that was. But she knows what a Dalmatian looks like. So she got her to say Dalmatian. That’s meaningful. So yeah, she was pretty frustrated with me by the end of it. The thing is that’s part of why I wrote this book. It was to combat some of these misconceptions about what we know about mediumship, how it works, and what you can expect. No medium is 100% correct. That’s highly edited, I imagine. So people are expecting things based from what they’ve seen on TV that mediums in reality can’t provide. What you do in the book is break it down in a step-by-step approach. You start by saying the first step would be to just make an observation. You make the observation that there is this medium and she claims to be getting this information from the dead. But I want to recast that observation a little bit because I think part of the problem we run into is we don’t fully appreciate the observation. To me, the observation is that throughout time, across every culture, so many great minds that we know of in science, in literature, in the arts, have claimed that they’ve observed this phenomena, either directly with spirit communication or specifically in your case, that there are these specially gifted people that have allowed them to connect with deceased loved ones. So I think sometimes when we spec out this space we make it sound a little more humble than we should be in terms of saying the counter to this, that this is not what we’ve observed, that this hasn’t happened thousands and thousands of times with the people we respect the most, is it’s really absurd to even suggest that we shouldn’t look at this seriously given the large amount of observations we’ve had of this phenomena. Do you have any thoughts on that in particular? Dr. Julie Beischel: That’s a really good point. Observation is this didn’t happen this one time; this happened millions of times. I’m an empiricist, so I how can I bring it into the lab? How can I study it over and over and over again? So that’s the way that I took it. It’s really just—the proper word would be ignorant—to say scientists are incapable of addressing something, anything. Science is a tool and it’s a process. So if you have a topic and you can make an observation then you can apply the scientific method to it. So I think that’s just not understanding what the scientific method is to say that you can’t use it to study X, Y, or Z.
Dr. Julie Beischel: Yeah, that’s too far ahead. We have to back up and say at the very base of it what can we ask and that would be, “Are they reporting accurate and specific information about the deceased?” Once we establish that then we can start over with a new hypothesis. If the answer is yes to that question, yes they are getting accurate and specific information about the deceased and we’ve eliminated all other explanations, then we can go to saying, “Okay, where are they getting this information if it isn’t through any normal means?” Then our hypothesis is they’re talking to the dead or they’re getting it from the sitter telepathically or that kind of thing. But yeah, you can’t start at they’re talking to the dead. Dr. Julie Beischel: You could—I’d like to see the design of that protocol, yeah. Alex Tsakiris: That’s right. I think that also is where the skeptics—and I don’t just mean the professional skeptics but the scoffers and the people who have a strong vested interest—don’t want to even go there which is what is really behind this. They want to frame things differently so that it creates a question that can’t be answered scientifically. Dr. Julie Beischel: Yeah, we could test true or false of what she’s saying is true. I think a really important piece of that is the only person that can gauge whether what the medium is saying is accurate is the sitter. Even if you sat there with a sitter for two weeks, 24 hours a day, and had them tell you everything they knew about this dead person that they were going to get the medium to talk to and then the reading happens and you have all this information. Without fail there would be something that the sitter has forgotten or whatever. The only person that can make sense of the reading is the sitter. It’s intended for the sitter; it’s communication between two people who had a relationship. A third party can’t determine what’s important or not. That’s why I have not included in the book any transcripts of readings. The only person that can gauge whether those things are indeed accurate and important is the sitter. You know, someone else may say, “Well, a lot of people have Dalmatians.” Well, that doesn’t matter. It’s important to me and my mom. We didn’t have any other kind of dog. We didn’t so that’s totally unique. She didn’t mention any other kind of dog. We get a lot of emails from people saying, “Why don’t you post the transcripts and then we could see if they were good mediums?” No, you couldn’t, because they aren’t your readings. The only person that can gauge whether a reading is meaningful and accurate is the sitter. Alex Tsakiris: Good point. I think it’s another area where people who are really inclined to disbelieve this, the professional skeptics, professional scoffer types, want to jump in there and what they’re failing to acknowledge is something that we all know. There’s a lot of this kind of subjective, first-person evaluation that goes on in science and then particularly where you started with in terms of pharmacology and toxicology and also in a lot of medical research, that’s all we have is a first-person account. Do you feel better? Are you less depressed? Dr. Julie Beischel: Right. Is there still pain? Yeah. Dr. Julie Beischel: That’s a really important point. The scientific method is a list of steps and people forget that the thing performing the steps is a human being. Lots of scientists like to think that they can remain objective to what they’re studying but they can’t. Because you are a person and you have a human brain, you will always have biases and you will always have assumptions. So the best you can do is address your assumptions and recognize your assumptions. A lot of times there have been papers published in peer-reviewed journals where scientists got negative results from mediums but there were a lot of assumptions like, well, if I put them in this box and I make them do this thing that I think they should be able to do and then they can’t do it then I will have disproven that mediums are real. That’s just silly. I make a big point of that in my book that there are two pieces of a good experiment and this doesn’t just apply to mediumship. It’s any of these anomalous phenomena that need these pieces in an experiment, which are optimal environment and maximum controls. So you want to study the thing as it exists in nature. Dr. Julie Beischel: Right, and me calling it a fraud when it couldn’t grow. Alex Tsakiris: Right. In this case though, how do we determine what is this “natural?” It sounds a little bit fuzzy when we say, “…the natural mediumistic kind of environment.” How do we get there? Dr. Julie Beischel: The mediums we work with are professional, full-time mediums. This is what they do for a living and so they have a way that they do what they do. A lot of times it involves a sitter calling them on the phone or vice versa and they have some kind of nugget of information. Sometimes some of them prefer to know the relationships. Some want to know the first name of the deceased person. Sometimes the sitter being on the phone is enough of the nugget. Then they provide the information about that person. So we have to mimic that situation because that’s what they do in real life and that’s what we want to study. Alex Tsakiris: Great. We should also point out that—you alluded to this—if you’re a debunker, this is a great way to derail any of these experiments because you can really muck them up in a way that not a lot of people are going to pick up on, right? So whether it’s mediums or any of these paranormal/psi kind of phenomena, you can just start changing the environment and you have a pretty good chance of messing these things up, right? Dr. Julie Beischel: Yeah. And the same thing with you can control your phenomenon right out of existence, right? You can impose too many rules on it that now it can’t even exist anymore. As we study these phenomena that’s a good thing to do, right? At what point can you make the phenomenon just disappear. You can say, “It can happen like this and this but not like this.” So now you have the line where you can’t pass it. In these fields the resources are so limited that we don’t have the option to do that so I have to just optimize it the best I can while controlling for all the other explanations for where the information could come from. So again, optimal environment and maximum controls. Alex Tsakiris: Right. We should touch on just a little bit more about the kinds of controls that you impose since you have written the book on it, or you’ve written the paper on it, and contemporary methods you’ve used in laboratory-based medium research. A paper that many people cite who are familiar with this kind of research. It’s kind of the gold standard for this kind of research. What were you really looking for in terms of the most important kinds of controls to impose on these experiments? Dr. Julie Beischel: We want to eliminate all of the explanations because once the information is accurate and specific they’ll say, “Well, she did a background check on you. That’s where she got all of the information.” So we have to eliminate all of those “Yeah, but it’s just [ ].” We have to eliminate all of those blanks that it could be. Cold reading is a big one. Fishing for information, where they’re getting feedback. Lloyd Aerobach pointed this out to me: another kind of cold reading that people sometimes forget about is just information so general it could apply to almost anyone. So that’s a type of cold reading, as well. Alex Tsakiris: All information that you don’t know, right? Dr. Julie Beischel: No. All I have is the first name. I don’t know anything about the sitter or the deceased person beyond the deceased person’s first name. Alex Tsakiris: So these controls are way beyond what any reasonable person would ask for in terms of really looking at this phenomenon in an open way. I mean, there’s not a lot of opportunity for any information exchange other than by some kind of anomalous means that we don’t understand. And of course, that I guess, is your result, your bottom line, your conclusion, right? That there must be some other means of this anomalous communication. Dr. Julie Beischel: Right. We feel quite statistically confident that this data demonstrates what we call anomalous information reception. They’re reporting accurate and specific information about the deceased that they couldn’t have gotten through normal means. Without any feedback, without any prior knowledge, and without using fraud or deception. Alex Tsakiris: Let’s talk for a minute about where we go with this research, what this research means, what are the implications for this research. I guess the starting point for that is possible explanations. I’ve got to say I was a little disappointed to hear you say that there are three possible explanations and they’re kind of neck-in-neck. You included super-psi as a possible explanation. Eww, that’s hard for me. I just completed an interview with Chris Carter on his new book, Science and the Afterlife Experience, and we had a good conversation about just what a weak explanation that is in terms of really addressing a large amount of the data that we have back. It just doesn’t seem to cover it in any significant way. I’ve already laid out my prejudice there, but tell me about the possible explanations that you see and how you would evaluate those possibilities. Dr. Julie Beischel: I had to include that, right? Historically that’s the big explanation but yeah, the bottom line is that’s a thought experiment. It was never intended as an actual explanation for information. It’s just sort of hey, what if it was this? It’s just a thought experiment; it’s not a falsifiable hypothesis. It’s not a scientific explanation. I just included it there because historically that’s an alternative explanation. Alex Tsakiris: We should back up for a minute because I jumped ahead of the game. Walk folks through in somewhat basic terms what the possible explanations are for what you’ve observed. Dr. Julie Beischel: For anomalous information reception? Dr. Julie Beischel: We put it into two schools of thought. One we call “somatic psi.” Somatic means body so that explanation includes that the medium is accessing the body of information stored in the universe. The Akashic-field or however you want to think of that. They’re not talking to the dead; they’re just accessing this body of information or we include in that the living people. They’re accessing information telepathically from living people. So we call that somatic psi. The second is called “survival psi.” In any case they’re using some kind of psi because it’s anomalous information transfer. In survival psi the explanation is that the medium is communicating with the survived consciousness of a once-living person whose consciousness has continued to exist after the physical death of the body. And then they’re using any other kind of psi ability but no dead people are involved. We call that somatic psi. Tell us why you think your research doesn’t support the idea of a grander spiritual reality. Dr. Julie Beischel: That’s going to cheese some people off, isn’t it? And it doesn’t not support it. I want to make that clear. It neither refutes nor defends. I think that was giving people who don’t buy into the New Agey kind of culture that is often surrounded by these topics that you can still can respect the data that the data demonstrate that they’re reporting accurate and specific information about the deceased. And even that the deceased consciousness is still around even though the physical body is dead. You can skip behind all that without needing to believe in God or Heaven or things like that. Consciousness may just have a characteristic of being able to live outside the body. That just may simply be a characteristic of consciousness. It doesn’t necessitate God or these other words that make some people uncomfortable. I just want to make that point. So I think what he’s saying is that if life really is meaningless, if we are these mere biological robots, then suicide is the only viable way out of this absurdity that we find ourselves in. Because there is no meaning to any of this. Even if we try and pin it on our kids, we’re just leaving them a meaningless existence. We’re just passing that along. I think we would rework that statement scientifically and say there’s only one real serious scientific question and this is God. Even though we can be uncomfortable with that, and I know a lot of people are really uncomfortable with that, I don’t care how you want to put it. You might want to say there’s only one real scientific question and that’s are we biological robots? There’s only one serious scientific question and that’s does the mind equal brain? I think it’s the same thing as saying is there consciousness and is that consciousness somehow meaningful? Is there meaning behind it? I think if there is then I think the scales tip way on the side of the God equation even though we can be really uncomfortable with that. That’s really where those implications go. I just go back to that very first part of the scientific method where we say we have this observation. Thousands of the greatest minds throughout history have said survival and now we come back and we look at your data and say your data on that question is confirming yes. It does suggest we are more. Mind doesn’t equal brain. So in my mind, if we’re really going to be honest what it suggests is more evidence tipping on the scale of God. Even if you don’t like that, that’s kind of my term. Why do we want to try and play this balancing act and say, “Well, it could be; it couldn’t be.” Do we really need to go there? Is that really scientific? Dr. Julie Beischel: Ohh. Here we go. First, that’s not my job. My job is to test empirically this phenomenon of mediumship and our institute is named the Windbridge Institute for Applied Research and Human Potential. So at the end of the day we don’t really care what’s happening but how it can help people. How can we use it? So that is really my main focus. I will leave it to the philosophers to have this discussion I think you’re trying to rope me into. But I honestly don’t think that you need to have a bigger—you know, this idea of the word spiritual, just the recognition that there’s something bigger than me. And I think that the thing that’s bigger than you can just be your relationship with other people that apparently, according to this data, continues even after the person dies. And even after you die. And even after your dog dies. That’s meaningful in and of itself. Do we have to assign grades to the meaning? That’s pretty cool right there. Do we have to have this grander destination of how it’s happening? No. That’s pretty cool right there. Alex Tsakiris: Well, I’m going to try and rope you in one more time. I’m not sure about needing a grander vision but I do want to pull you back into the science game because that’s where I think there’s this gap. There’s this chasm that we have to cross over. I really want to get your opinion on this because it’s interesting to me. Your research to a certain extent invalidates science as we know it. We can say science is not a position, it’s a method. We can say all those other nice things, but at the end of the day it seems like there’s a lot of trying to put the genie back in the bottle here. What your research suggests is it adds to this growing body of data that suggests we can’t really measure things in the way we think we can. In the way that’s required in science. So we can look at Daryl Bem’s experiment, the famous parapsychology experiment where he showed that college students can study a vocabulary test after they take it and it will improve the results before they take it. Or we can look at Dean Radin, who showed the same thing with his presentiment experiment where people know the future before they have it. But when you start putting that together and we throw your research in there, what I think it does to our scientific worldview is say, “You know what? We shouldn’t be very sure of anything because we don’t really know what we’re measuring.” And more to the point of your research, what I think it says to me is that we always have to have this X factor on anything we think we know from science because we don’t know what old, dead Uncle Joe is doing. How he fits into the equation. So forget about the grander spiritual picture for a minute and let’s bring it back to science. Doesn’t your research to a certain extent question the very nature of science in that it questions our ability to measure things? Talk a little bit about what we know about grief and what might be the connection between grief and this anomalous communication that people are getting in a mediumistic reading. Dr. Julie Beischel: What we know about grief is that it is ubiquitous in all cultures and in the animal kingdom. It’s a natural process. Most of the time, like 80% of the time, people get to the end of grief with no outside assistance, just with their natural support system from their family and their community. What we also know is that there are no stages of grief. There are no tasks of grief. Everybody grieves differently. However you’re grieving, that’s good for you. But there is a smaller percentage of people that get stuck. That grief can be called traumatic grief; there are a lot of different terms for it. So that’s the clinical population that we would be interested in—we as the mental health community. That 20% need assistance and so I highly recommend this book called, The Truth About Grief. A journalist, Ruth Davis Konigsberg, wrote it about how she investigated what we know about grief and it’s fascinating. She points out that the United States is one of the only countries that has a profession called Grief Counselor. Other cultures recognize that you don’t need someone specific to do that. One of the other really important things, I think, is there’s this grief memoir culture so people write books about their horrifying grieving experience. That’s what we hear about and see on TV so people mistakenly think that must be normal. That must be how people grieve. It’s not. If you just have a natural grief process, you’re in the 80%, then you don’t write a book. You don’t go on TV. So people mistakenly think that these really detrimental, horrible grieving experiences are the norm but they’re not. That’s the big piece right there. This 20% needs assistance. Alex Tsakiris: Julie, let me just interject. We’re taking these very deep, personally meaningful topics here and we’re looking at them very stark, scientific, clinically. That’s great because I think that helps us get some distance from it. But on this issue of grief, if we look at it that way as you have, it really breaks down pretty nicely scientifically. Okay, there are these people who report this condition. We’ll call it grief. We treat this condition on a regular basis. We send them to a talking psychologist or psychiatrist and that person talks—talks—talks–talks. Then we measure afterwards. Sometimes they’re better; sometimes they’re not. Or we send them in and they get some kind of pharmacological treatment. They get these little pills and they take them, pop–pop–pop. They either get better or they don’t. We measure that. I think what you’ve suggested is hey, here are some other people that report that they had this reading with a medium. And in the same way we’re measuring these other things and we have a vested interest and a lot of money is at stake in measuring those things, we can measure in the same way whether or not they showed any improvement in this grief experience that they had after a reading. I mean, that is how it breaks down, isn’t it? Dr. Julie Beischel: Yeah. That’s my training, drug trials. I design a protocol and there’s a control group and a treatment group, just like a drug trial. Instead of a drug it’s a mediumship reading. I design this very specific protocol using a standardized grief instrument and two different funders have not found it to be what they were looking for. But it needs to get done. We’re now in the process of reaching out to the public to try and get support for that study. It really needs to be done. Alex Tsakiris: And your hunch from doing this research for ten years and being on the front line is that as people have reported for a long time it does help, right? Dr. Julie Beischel: Yeah. Anecdotally that’s what we’re hearing. But we need to collect this data so that we can then ask all the questions that come after it. Who does it benefit most? When is it beneficial? What kinds of deaths do people benefit most from a mediumship reading? I want to be clear because this really ruffles the feathers of people in the mental health community. We are not, under any circumstances, saying that mediumship readings should replace work with a mental health professional. It’s two different things. Any traditional grief professional will tell you that the purpose of the grief work is to re-define the relationship. So a mediumship reading is really helpful with that because it lets you know that the person is still around and still aware of your life and still participating in your relationships. They just don’t have a body anymore. The future that I foresee, that I hope we get to, is working together with the grief community in that grief counselors can have a list of mediums that they trust and recommend and can send people to and then we can learn when the best time is to send people to a medium. Then the person can take what they learned in the mediumship reading back to the counselor. The counselor can help them integrate the information that was given during the reading because the medium can’t do that. She has one job and it’s not to counsel you. It’s to act as the medium between you and your deceased person. So the future that I hope to see is this collaboration between the two populations. We’re interested in working with people. I have spoken at conferences and a number of counselors have come up to me and been very supportive. There’s a group called ACISTE, the American Center for the Integration of Spiritually Transformative Experiences, and they’re very supportive of this idea, too. We need to educate the mental health professionals about these “strange” kinds of experiences, spontaneous or visiting a medium, those sorts of things, so that those people are qualified to know when to send you to a medium and how to help you integrate what happened during the reading. But we have to start with, does it indeed under experimental conditions using a standardized grief instrument, does it make people feel better? Alex Tsakiris: Julie, you’ve set up a website for the book, Among Mediums. It’s available on Amazon. It’s a great read. You’ll really enjoy it. It’s only $4.95 on Kindle. Also there’s still the Windbridge Institute website where folks can go and follow your research, become a member, and all that stuff, right? Dr. Julie Beischel: Right. People can go to www.amongmediums.com to learn more about the book and they can go to www.windbridge.org to learn more about our organization and sign up for our email list to be notified when we are going forward with this study and that sort of thing. Alex Tsakiris: It’s been great having you on. We certainly wish you the best of luck, not only with the book but with this very, very important work that you do. Great to talk to you again, Julie. Thanks so much for joining me on Skeptiko. Dr. Julie Beischel: You, too. Thank you. Can I say one more thing? Dr. Julie Beischel: I think that people get a little itchy that it’s a Kindle book. They say, “I don’t have a Kindle.” There’s a link on www.amongmediums.com where if you’re listening to this on any device you can read the book on that device. So there are free Kindle readers for almost any device you can think of. Alex Tsakiris: So you can read it right on your notebook or desktop or whatever. Dr. Julie Beischel: Your phone, yeah. Alex Tsakiris: And it’s a really fun book to read. You’ve made it very accessible. You’ve made it very personal, which is great. People feel like they’re riding right along with you. I think anyone who’s at all interested in this topic will really enjoy it. I do hope people pick it up. Dr. Julie Beischel: Me, too. Thanks so much for having me, Alex.